It is such a lovely design and would make a gorgeous addition to any project. Owls and Butterflies – such a great combination. Owls Butterflies Ribbon is such a lovely design and would make a gorgeous addition to any project. 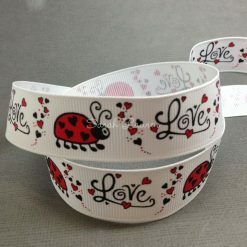 Wow how adorable is this printed ribbon! Bow making, sewing, scrapbooking, card making, Christmas decorations, baby books and the list goes on. Our grosgrain ribbon is used by hair accessory makers to make bows, scrapbooking creations, sewing projects and for gift wrapping. The possibilities are endless with this versatile ribbon. Sarah Lauren is the perfect place to find 25mm printed grosgrain ribbon and craft supplies online in Australia. At Sarah Lauren we strive to provide our customers with a diverse range of ribbons, hair clip making supplies, Cactus ribbon, embellishments including hot fix rhinestones and rhinestone buttons and plenty of other craft supplies. If there is something you need and we do not stock it please ask. We love to add new products to our store. Sarah Lauren is where you will find 38mm printed grosgrain ribbon.